I’m delighted to announce I will be taking part in this event and reading a brief excerpt from White Feathers. 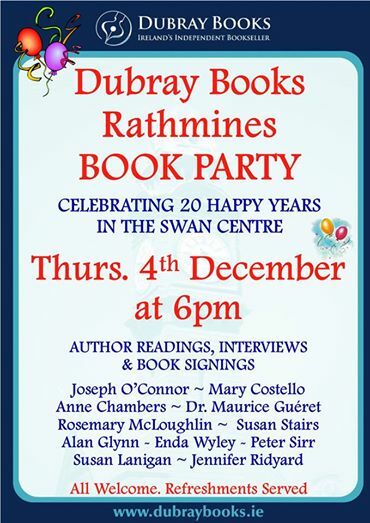 It takes place in Dubray Bookshop in the Swan Centre Rathmines at 6pm until 8pm and refreshments are served. There are some other great authors, such as Joseph O’Connor, author of Star of the Sea, and Ghost Light, The O’Brien Press’s Peter Sirr, and Mary Costello, whose work Academy Street has been recently and deservedly lauded by the Irish Book Awards. Dubray Books are an independent chain who have been very supportive of Irish authors and quality fiction. Come along, you are all very welcome! I’ll also be down in Cork city and Schull next weekend – for more info, check out my FB page and calendar. Previous Post Out and About in Yorkshire!